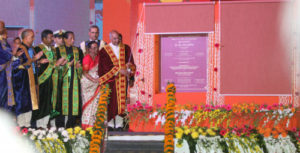 Bhubaneshwar,: President Ram Nath Kovind, inaugurated the Institute of Chemical Technology (ICT) Mumbai – Indian Oil Corporation Bhubaneswar campus here today. 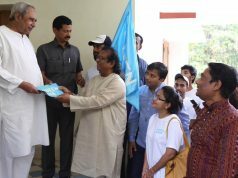 He also laid the foundation stone of the permanent campus of Skill Development Institute (SDI), Bhubaneswar. Both the initiatives promoted by IndianOil under the aegis of Ministry of Petroleum & Natural Gas were launched at the 6th Convocation programme of the Indian Institute of Technology, Bhubaneswar, with the Hon’ble President as the Chief Guest. Other dignitaries present on the occasion were Dr. SC Jamir, Hon’ble Governor of Odisha; Shri Dharmendra Pradhan, Union Minister for Petroleum & Natural Gas, Skill Development & Entrepreneurship; Dr. Satya Pal Singh, Minister of State, Human Resource Development, Govt. of India; Shri Sanjiv Singh, Chairman, IndianOil; senior officials from Oil PSUs; leading lights from academia and skilling sector; and prominent guests from across the spectrum of society. The Hon’ble President hoped that the ICT-IOC campus would evolve into a innovation hub for carrying out high-end research in chemical engineering, petrochemicals, textiles, pharmaceauticals and energy. 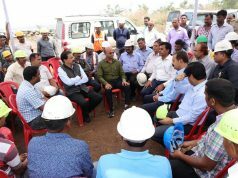 He expressed happiness that the Skill Development Institute of IndianOil aims to train about 50,000 youth over the next 10 years at its permanent campus. Speaking on the occasion, Shri Dharmendra Pradhan, Union Minister for Petroleum & Natural Gas, Skill Development & Entrepreneurship, said, “I am happy that ICT Mumbai, and Indian Oil Corporation have joined hands to set up a world-class Centre of Excellence in Chemical Engineering & Technology at Bhubaneswar to catalyse the structured growth of industries in Odisha in diverse sectors such as petrochemicals, chemicals, polymers, textiles and fibres. With an investment of Rs. 500 crore, I am sure that ICT-IOC Centre will shape up into a world-class institute with latest facilities and equipment. Dr. Satya Pal Singh, Minister of State, Human Resource Development, congratulated the Ministry of Petroleum & Natural Gas for the unique educational and skill development initiatives. The Institute of Chemical Technology (ICT), Mumbai, is one of the leading research institutions worldwide, and is a Deemed University with elite status like IITs and the Indian Institute of Science. The Institute has produced many outstanding alumni like Dr. RA Mashelkar, Prof. MM Sharma and Dr. Homi Sethna, who have made significant contributions in Chemical Engineering and allied fields. ICT-Mumbai has been closely working with industry and government in the interest of the nation and has active MOUs with many national and internationally renowned universities and industries. All these programmes are new and are being introduced in India for the first time. During the industrial internship, students will receive stipend from industry, making the education affordable to one and all. The campus will be fully equipped for carrying out high-class research and innovation at Centres of Excellence to develop technology and to support Research & Development in industry and Skills Development in Chemical Engineering, Petrochemicals, Textiles, Polymers, Pharmaceuticals, Energy, etc. The initial investment for establishing the first phase in the temporary campus is around Rs. 100 crore. ICT has applied to the State Govt. for 100 acres of land for setting up a full-fledged campus with an approximate investment of Rs. 500 crore for establishing a world-class institute with latest facilities and equipment. The number of students to be trained in the institute after setting up will be around 2000, including Graduates, M Techs and PhDs. Highly accomplished faculty will be recruited, including superannuated scientists and engineers from industry. The manpower being trained in this Institute will cater to Chemical, Energy, Materials and bio-tech industries, including sectors of petrochemicals, textile, pharmaceutical, food & food processing industries, etc., for industries in Eastern Region. The first academic session of the maiden programme of the ICT- IOC campus at Bhubaneswar is starting from this academic session. Eastern India is poised to chart a high growth path in the coming years and offers immense potential for the growth of the Plastics and Textiles industries. The region has access to a plethora of raw material necessary for the optimal development of these industries. Besides, it also possesses the necessary infrastructure, including ports, railway connectivity and road networks that will facilitate the speedy development of the two industries. Paradip is the most strategically located region for investment in Petroleum, Chemicals and Petrochemicals. Indian Oil Corporation’s 15 million tonnes per annum oil refinery at Paradip, built at an investment of Rs. 35,000 crore, is adding a new polypropylene unit of 700 KTA (kilo tonnes per annum) capacity to support the polymers/plastics industry. A world- class 357 KTA Ethylene Glycol Plant is also coming up at Paradip with an investment of Rs. 4,107 crore, which is likely to be commissioned in 2021. Several other projects and proposals are lined up at Paradip Refinery. Once these projects go on stream, Paradip will evolve into a petrochemicals hub, leading the industrial growth in Odisha and adjoining areas in the Eastern Region. Odisha needs extensive and innovative inputs from institutes like ICT-IOC Centre, besides mother plants like IndianOil’s Paradip Refinery. The ICT-IOC Centre at Bhubaneswar will act as an innovation hub to catalyse the structured growth of industries in the State in diverse sectors such as petrochemicals, chemicals, polymers, textiles and fibres. Other sectors such as herbal, pharmaceuticals, pesticides, dyestuff & fine chemicals, perfumers & flavours, rubber and chemicals will also benefit from the expertise of the Institute. Also on the cards is the establishment of an Industry Interaction Cell and creation of joint research facilities with industries of Orissa at the national & international level. Skill India is a flagship project of the Government of India launched by the Prime Minister on 15th July, 2015. The National Skill Development Mission aims to train over 400 million (40 crore) people in India in different skills by the year 2022. In the year 2015, the Ministry of Petroleum & Natural Gas embarked on a unique initiative of setting up six Skill Development Institutes (SDIs) in different parts of the country. The locations chosen were Bhubaneswar, Nagaram and Visakhapatnam in Andhra Pradesh, Ahmedabad, Guwahati and Kochi. Indian Oil Corporation took the initiative of setting up the country’s first Skill Development Institute in the Hydrocarbons Sector at Bhubaneswar. The pilot campus of the Skill Development Institute, Bhubaneswar was inaugurated on 9th May 2016, where about 150 students per batch are being skilled in five trade courses of 3 to 6 months duration each. SDI, Bhubaneswar, is now getting its own campus for setting up a world-class mega-model skill academy. The permanent campus of the Institute will be set up with technical support from the National Skill Development Corporation (NSDC). The Institute will be a state-of-the-art facility with a high level of technical sophistication, latest technologies and innovative, green design. The courses offered are not for profit and the fee structure is very nominal while the infrastructure will be state-of-the-art that can offer the best of skill training facilities with a high level of technical sophistication.